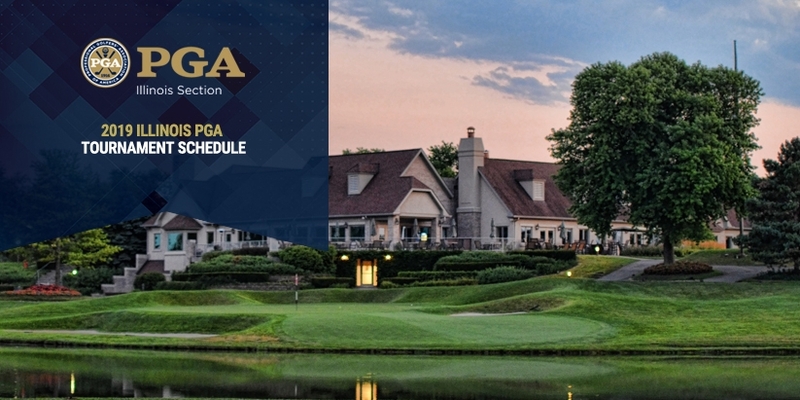 GLENVIEW, Ill. -- The Illinois PGA announced its 2019 tournament schedule today which includes the 70th Illinois Open Championship that will be contested at The Glen Club in Glenview, Ill. and Ridgemoor Country Club in Chicago, Ill. August 5-7. In addition, the Illinois PGA Championship which has been contested at Stonewall Orchard Golf Club and Medinah Country Club the past two seasons will move to Ruth Lake Country Club in Hinsdale, Ill. August 26-29. The Illinois PGA tournament season kicks off on April 8 with the Pro-Pro-Pro Scramble at Harborside International – Port Course. Other highlights include: Illinois PGA Match Play Championship May 6-9 at Kemper Lakes G.C., Illinois PGA Assistant Championship July 15 at Elgin C.C., Illinois PGA Senior Championship August 12-13 at Merit Club, Illinois Senior Open Championship September 16-17, and the Illinois Super Senior Open Championship October 8-9 at Makray Memorial G.C. To increase opportunities for competition for PGA Professionals, non-PGA professionals and amateur golfers throughout the state, the Illinois PGA doubled the starting field size of the Illinois Open in 2014, necessitating two courses to accommodate the first and second round. The 2019 starting field will be comprised of 264 participants who will qualify in one of seven qualifying events conducted from June 24 to July 31 in addition to those exempt from qualifying. The first and second round will be held Monday, August 5 and Tuesday, August 6 at The Glen Club in Glenview, Ill. and Ridgemoor C.C. in Chicago, Ill. For the first and second round, participants will play one round each at The Glen Club and Ridgemoor C.C. Following 36 holes of play, the field will be cut to the low 50 players plus any competitor within 10 shots of the lead. The championship round will be contested on Wednesday, August 7 at The Glen Club. The Tom Fazio-designed Glen Club opened in 2001 as part of The Glen which transformed the former Glenview Naval Air Station into a multi-use development including homes, condominiums, a downtown shopping center, golf course and more. The course routing features dramatic elevation changes – up to 40 feet on certain holes – mature trees and natural areas, lakes and streams. Many elements of a superb Fazio design are here and offer a challenge in many forms, from the classic perched greens undercut by bunkers to peninsula greens surrounded by water. The Glen Club is currently ranked 90th on Golf Magazine’s Top 100 Courses You Can Play list and No. 2 on the publication’s list of Best Courses You Can Play In Illinois. The course measures 7,170 yards from the back tees playing to a par 72. Situated 13 miles northwest of downtown Chicago, Ridgemoor Country Club is a traditional Midwest tree lined golf course established in 1905. The golf course is a culmination of redesigns by such notable architects as William Langford, A.W. Tillinghast and most recently Rick Jacobson who completed a course renovation in 2015. Ridgemoor Country Club played host to the Hale America National Open in 1942 which was arranged to replace the U.S. Open that was cancelled due to World War II. The course record is held by Ben Hogan and Bob Zender who both shot 62. The course measures 6,922 yards from the back tees playing to a par 72. Vince India from Deerfield, Ill. (Deerfield H.S./University of Iowa) is the defending Illinois Open champion. He won the 2018 tournament with a score of 202 (14-under). CLICK HERE to view the full 2019 Illinois PGA tournament schedule. Administered by the Illinois PGA since 1950, the Illinois Open has historical roots dating back to 1922. The state championship of golf is a 54-hole competition contested over three days to determine the finest player in the state of Illinois. The tournament is open to professionals and amateurs with a handicap of 10 or less who reside within the state of Illinois. Qualifying events conducted from June 24 to July 31 will determine a field of the top 264 players. For more information or to register for any of the qualifiers, please visit www.ipga.com.